Gov. 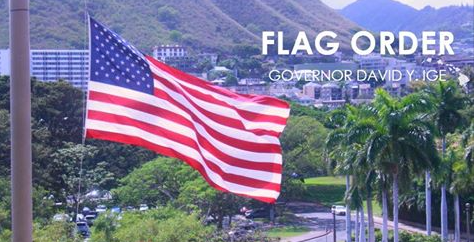 David Ige has ordered that the flags of the United States and State of Hawai‘i shall be flown at half-staff at all state offices and agencies, as well as the Hawai‘i National Guard, as a mark of respect for the late former Hawai‘i State Rep. Bertha Kawakami, on Saturday, Jan. 13, 2018. Flags will be flown at half-staff from sunrise to sunset on Saturday, Jan. 13, the day of Kawakami’s memorial service.